At the end of March, Chad and I visited New York City for our seventh anniversary. My first post covered Rockefeller Center, Times Square, Chelsea Market, Greenwich Village, and New York Style Pizza. Today I am featuring a recipe for Bagels along with our experiences at the 9/11 Memorial and Museum, Statue of Liberty, and Ellis Island. Disclaimer: I received a ticket to the 9/11 Memorial and Museum in exchange for my honest review. All comments and opinions are my own. This post contains affiliate links. We started our day with a quick stop to Ess-a-Bagel. It was only a 5 minute walk from our hotel (The Lexington) in Midtown. I have heard that lines can get long, but we were lucky on a drizzly, early Sunday morning. I had a plain bagel with egg and cheese while Chad had one with a thick layer of cream cheese. It was one of the best bagels I have ever tried and definitely the perfect way to start the day. Along with bagels with a variety of toppings and spreads, Ess-A-Bagel also serves salads, sandwiches, soups, knishes, desserts, and more. 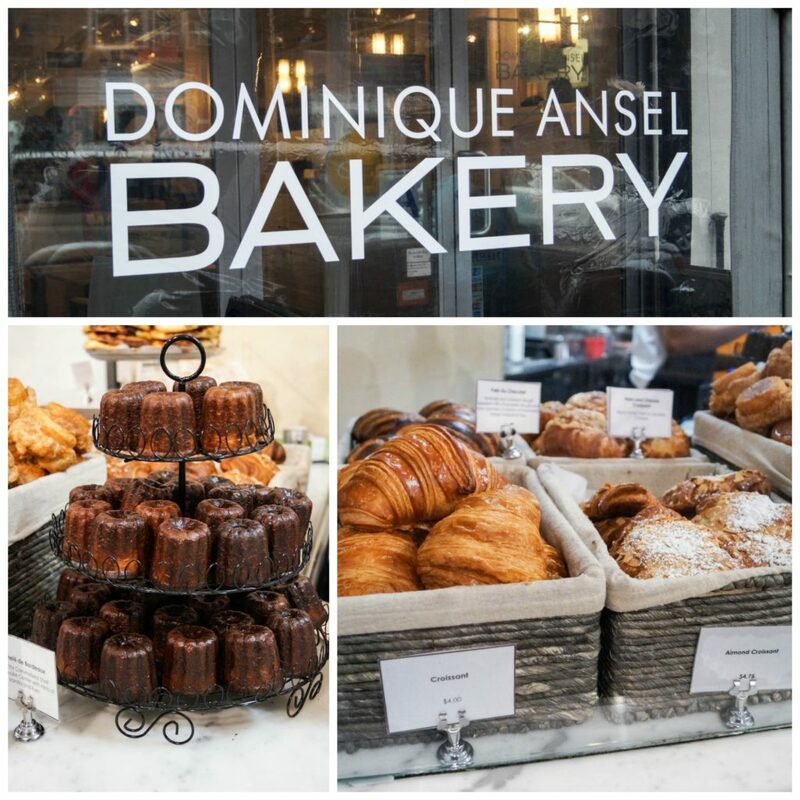 From Ess-a-Bagel, we made our way to Lower Manhattan and stopped by the Dominque Ansel Bakery on Spring Street. The space inside the bakery itself is small with only a couple of tables. Lines form outside early for the Cronut with groups of around 10 being let inside at a time. If you won’t be ordering a Cronut, then you can bypass the line and walk right into the bakery. 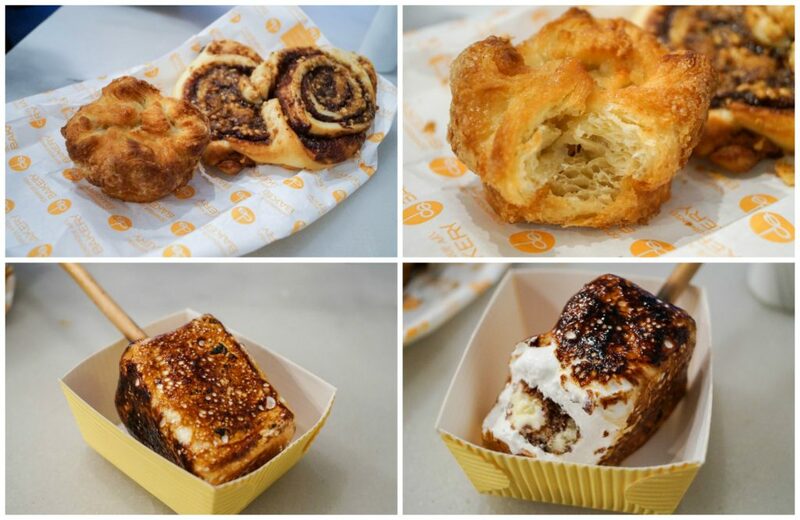 We picked out the DKA (Dominique’s Kouign Amann), Nutella Milk Bread, and Frozen S’mores. The Kouign Amann is a Breton pastry made in a similar manner to a croissant to create flaky layers with a caramelized crust. The Frozen S’mores are made by wrapping a honey marshmallow around firm Tahitian vanilla ice cream and chocolate wafer crisps. It is torched to order and served on a smoked willow wood branch. If you do want a Cronut, be sure to arrive early. They often sell out. You can also order them online two weeks in advance starting at 11 am Monday EST. The one available flavor changes every month. In March, it was Blackberry Brown Sugar with Toffee and the current flavor is Raspberry Earl Grey with with Earl Grey Sugar. I actually have Dominique Ansel’s cookbook, but haven’t tried any of the recipes yet. I can’t wait to recreate the Frozen S’mores at home. 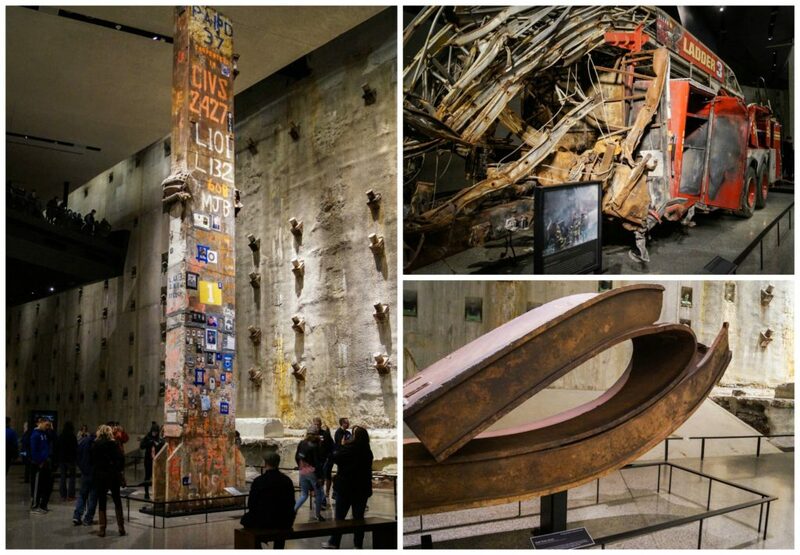 A quick subway ride (or 20 minute walk) brought us to the 9/11 Museum & Memorial at 180 Greenwich Street. 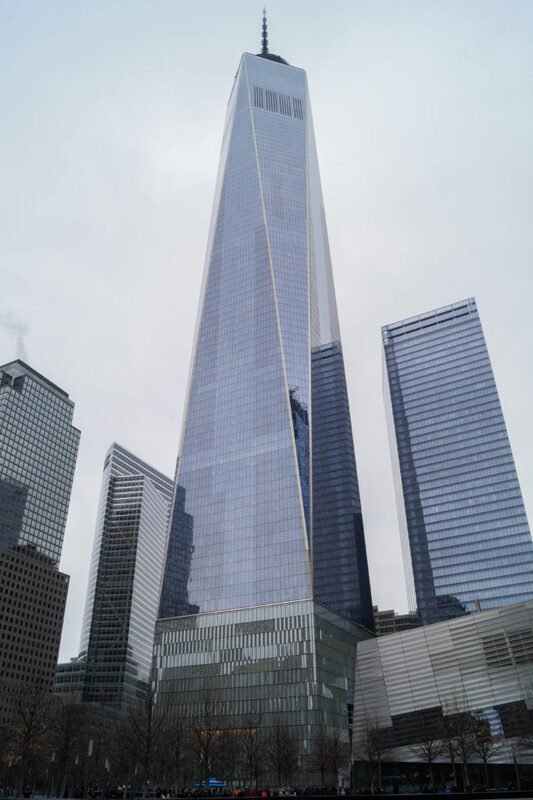 The Memorial (opened on the 10th anniversary, September 2011) and the Museum (opened May 2014) are located over 8 of the 16 acres of the World Trade Center and honor the 2,983 people who were killed in the September 11, 2001 and February 26, 1993 attacks. 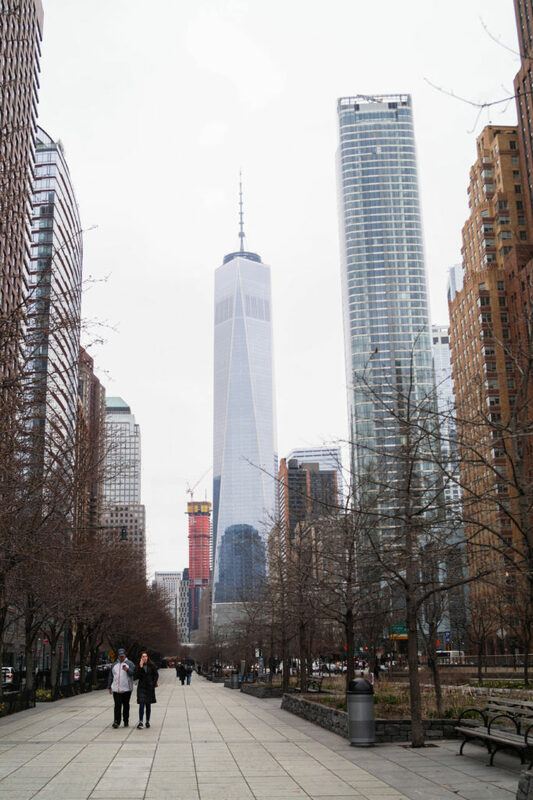 As you walk towards the Memorial, One World Trade Center dominates the skyline. 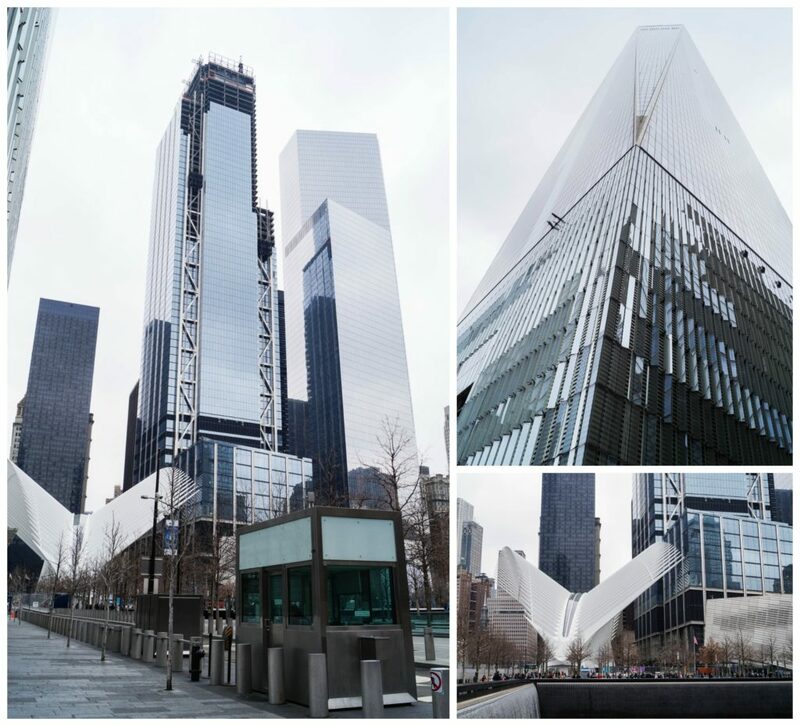 It was completed in October 2014 and is now the tallest building in the western hemisphere and sixth tallest in the world at 1,776 feet and 104 stories. We did not go inside, but there is an enclosed observation deck on the 100th floor. 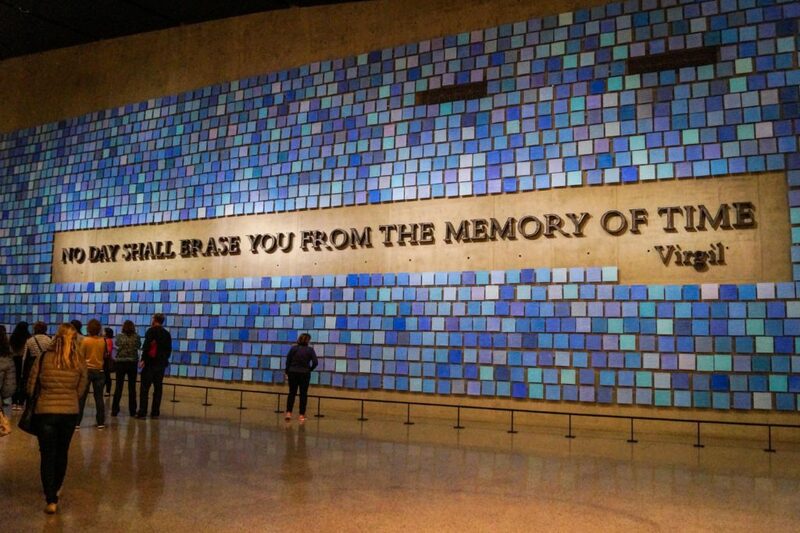 The Memorial is open daily from 7:30 am to 9 pm. The Museum is open daily from 9 am to 8 pm Sunday-Thursday (last entry 6 pm) and 9 am to 9 pm Friday-Saturday (last entry 7 pm). Current pricing (2017) for the museum is $24 for adults; 18 for US college students, seniors, and US Veterans; $15 for those 7-17; $12 for FDNY/NYPD/PAPD; and free for members. 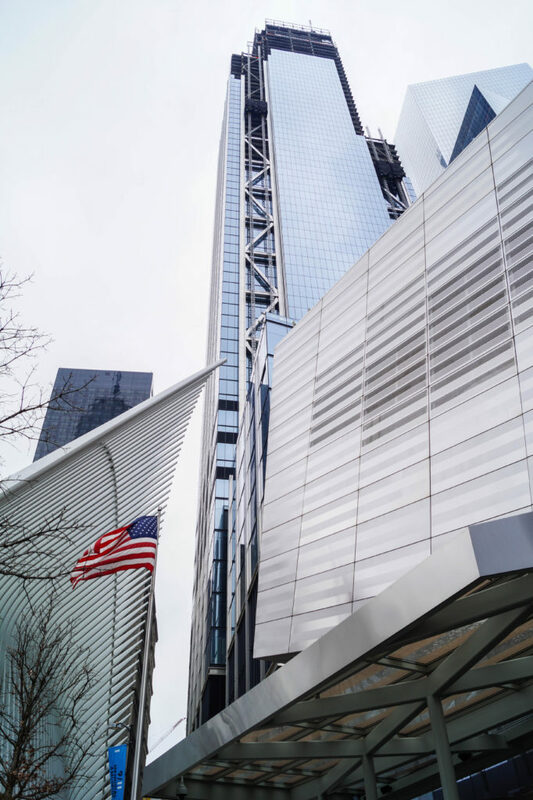 It is also free for 9/11 family members, active/retired US military, 9/11 rescue and recovery workers, ages 6 and under, and the public from 5 pm to close on Tuesdays (first come first serve tickets starting at 4 pm). 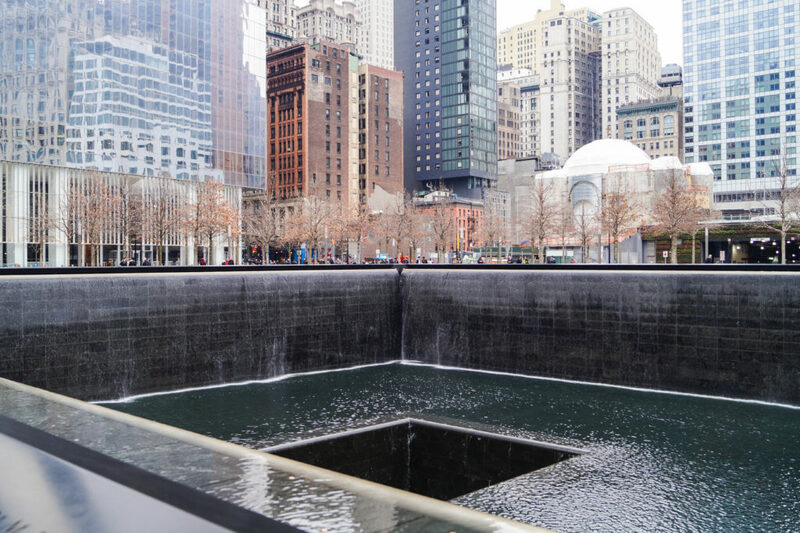 The Memorial plaza outside of the museum was designed by Michael Arad and Peter Walker and holds the two reflecting pools where the original twin towers once stood. The edges of the pools have the names of the 2,983 people etched around the sides. We saw white roses on a few of the names and later found out that they are placed by staff every morning for those who have a birthday that day. The pools are each nearly an acre in size and have the largest manmade waterfalls in North America (30 feet). They are surrounded by hundreds of swamp white oak trees. After spending some time at the memorial, we made our way to the museum. Tickets to go inside are timed-entry with no re-entry allowed once you are inside. There is a security line at the entrance. When visiting, please be respectful as this area is for remembrance and quiet reflection. Refer to the rules and regulations before visiting. Oversized strollers are not allowed. Note that some sections may not be appropriate for those under the age of 10. Here is a guide for those with visitors between 8-11 years of age. There are also activity stations on Saturdays in the Museum’s Education Center from 10:30 a.m. to 12 p.m. and 1 p.m. to 4:30 p.m.
After passing through security, we walked down the stairs to the exhibits. We were surrounded by the flags of the 99 countries with victims affected by the attacks to help signify the global impact. The Tridents (photo above) are two 80-foot tall columns that once formed part of the outside of the North Tower. Both towers had 84 of these columns each to form the perimeter of the first five stories. It took us about 2 hours to walk through the museum and its exhibits. The nonprofit foundation has over 60,000 items with more than 900 personal objects on display in the 110,000 square feet of exhibition space. What struck out the most to me was that we were surrounded by the heart and foundations of the two towers. 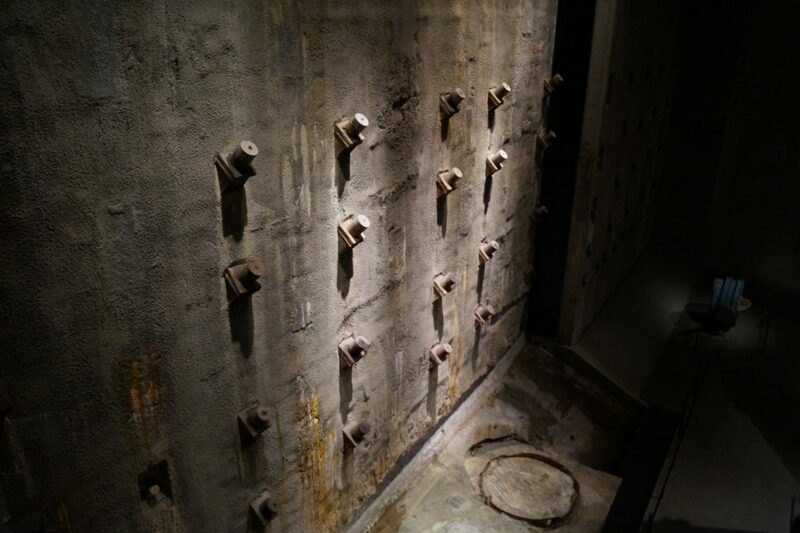 The exhibits took us through the events of the day from the unfolding of the news broadcasts to the answering machine recordings and radio dispatches of the victims, and the immediate and subsequent aftermath including health effects of the survivors. The massive Foundation Hall with 40-60 foot ceilings houses the slurry wall (photo above), a retaining wall that withstood the collapse of the towers, and the Last Column. 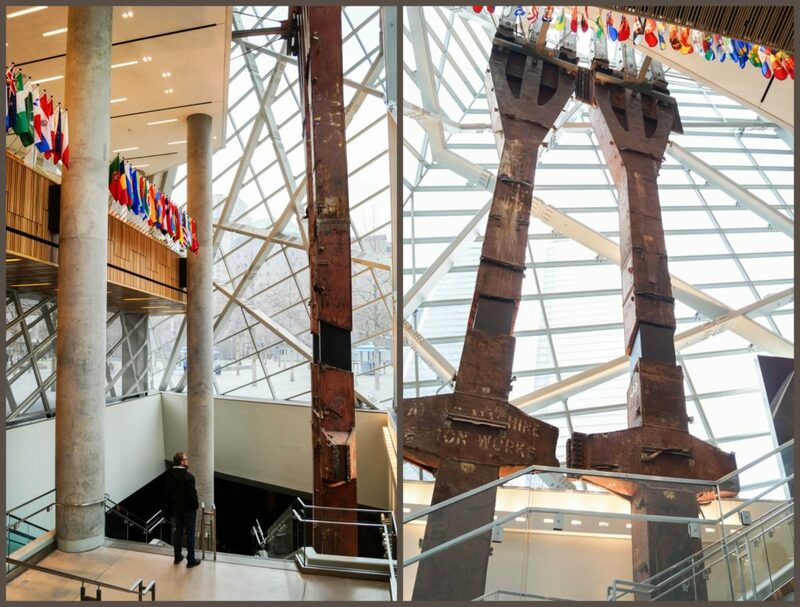 The 36-foot high Last Column was the last steel beam to be removed from the site in May 2002 and is covered by memorials, notes, and other mementoes from ironworkers, rescue personnel and others. The exhibit,“In Memoriam” (not photographed), features the portraits of most of the victims along with biographical information, quotes, interviews from family members and friends, and personal items. Overall, this was an incredibly sobering and emotional experience. The personal touches were particularly moving and I definitely recommend including the site on a trip to New York City. 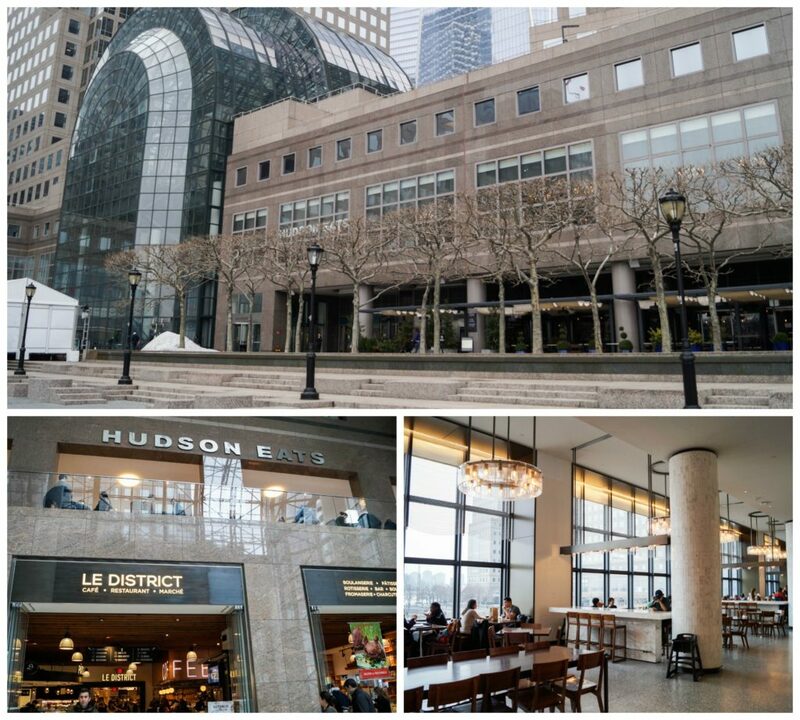 Just a quick 5 minute walk from the World Trade Center is Hudson Eats, a large food court inside Brookfield Place with views of the Hudson River. 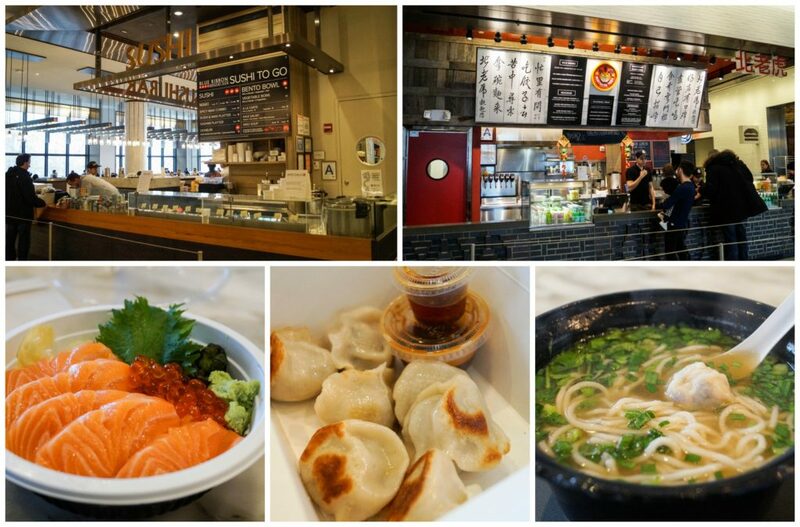 There were plenty of upscale counter-service restaurants to choose from including Black Seed Bagel, Chop’t, Dos Toros Taqueria, Num Pang, Sprinkles, and more. While we didn’t have Evan and Claire with us, Hudson Eats also seemed like a great place for families. There are a variety of seating options and even a few high chairs. Chad picked out the Rice Bowl from Blue Ribbon Sushi Bar while I had the Pork Dumplings and Chicken Wonton Noodle Soup from Northern Tiger. Everything was delicious and perfect for holding us over while we visited the Statue of Liberty and Ellis Island. 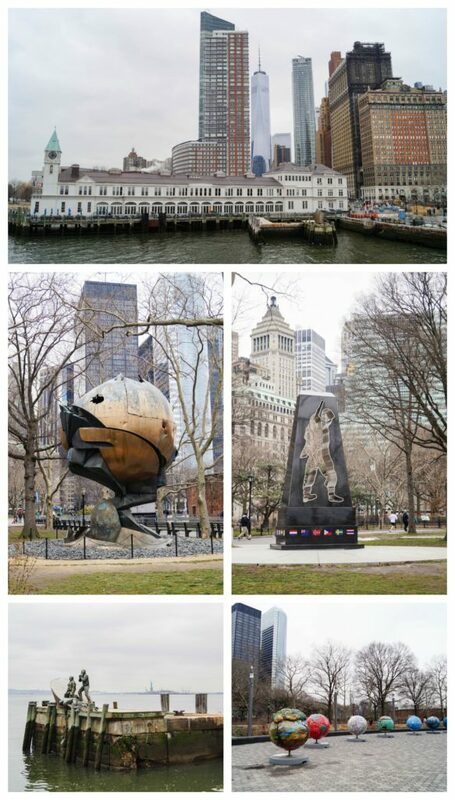 It was a 15 minutes walk down to Battery Park from Hudson Eats. We had timed tickets for the Statue of Liberty for 1 pm. Once it was our time, we went into the security line and waited for the next ferry. If you are able to find a spot, go to the top of the boat and along the rail on the right side towards the back. 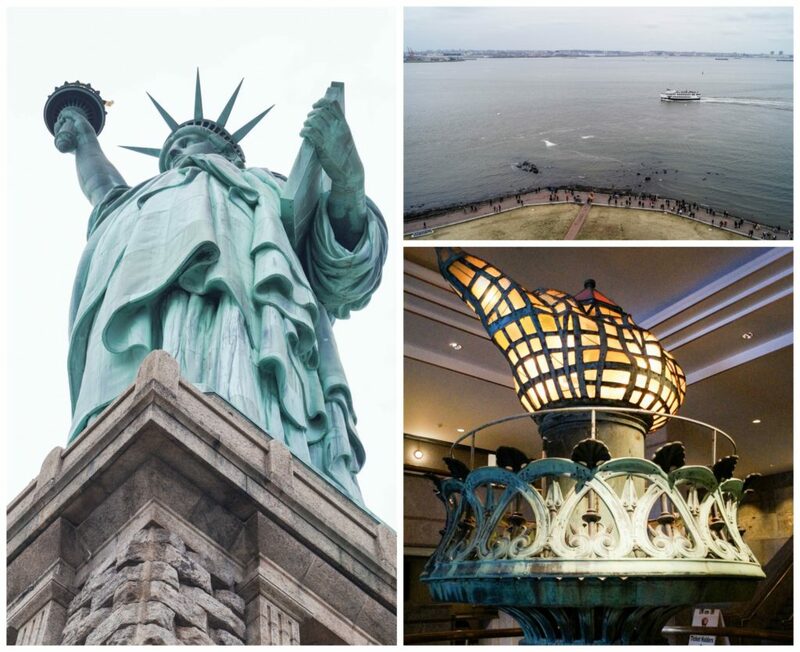 This will give you the best views of the Statue of Liberty and the skyline of Manhattan. On our boat, everyone rushed to the left side to get the first views of the monument, but you can get great shots on the right as the boat turns. 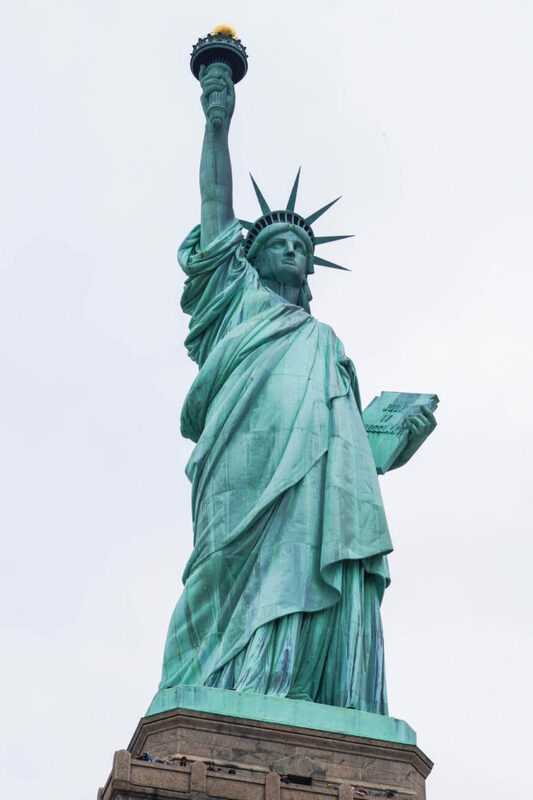 The Statue of Liberty stands on Liberty Island in the New York Harbor with Ellis Island a short boat ride away. It can only be accessed through Statue Cruises. 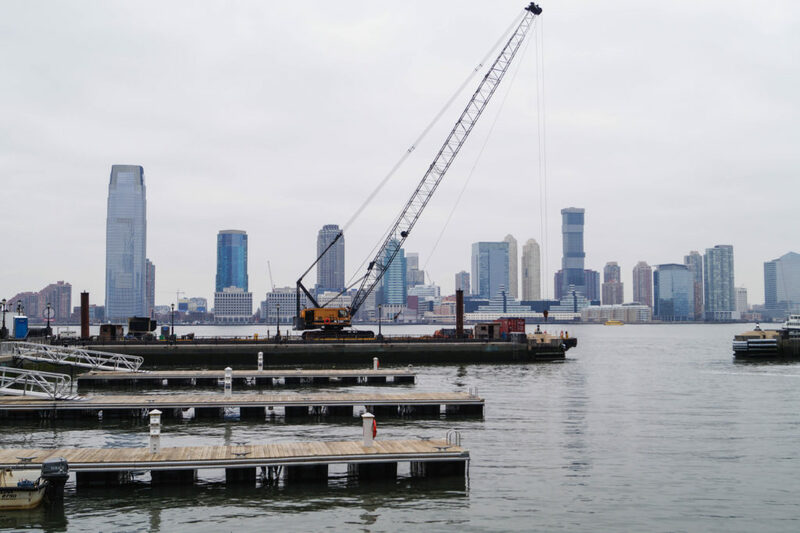 Tickets are timed with the first ferry departing at 9:30 am and the last at 3:30 pm (hours vary seasonally/closed on December 25th and may close in inclement weather). 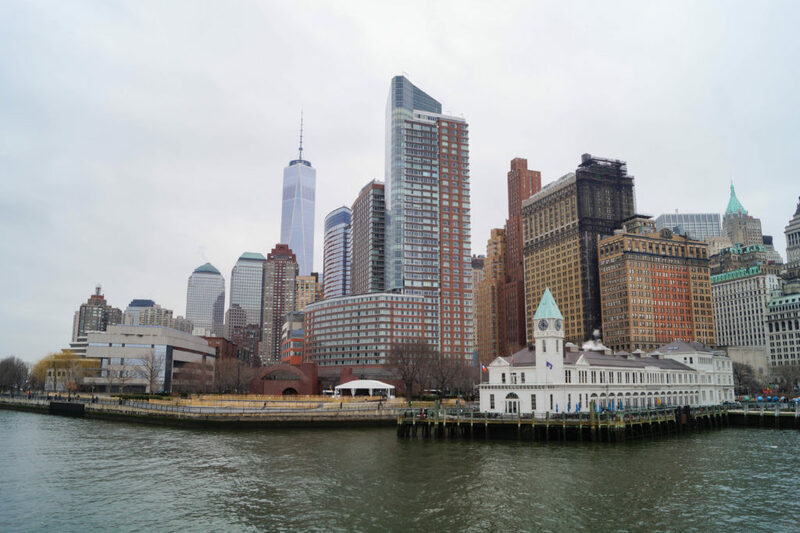 The ferries depart from Battery Park in NYC and Liberty State Park in New Jersey. When returning back to either location, make sure you board the correct ferry. Current prices (2017) for reserve and pedestal are $18.50 for adults, $9 for ages 4-12, and $14 for 62 and over. We didn’t plan our trip until about a month before our visit, but you can order the Crown Access tickets if scheduling many weeks in advance. Crown access tickets are 21.50 for adults, $12 for ages 4-12, and $17 for 62 and over. They are limited to four per cardholder and children must be at least 4 feet tall. It is a 20 story walk up to the Crown, 162 steps up a spiral staircase, so plan accordingly. Before entering the pedestal and crown, all food and backpacks must be stored in lockers ($2 cash). 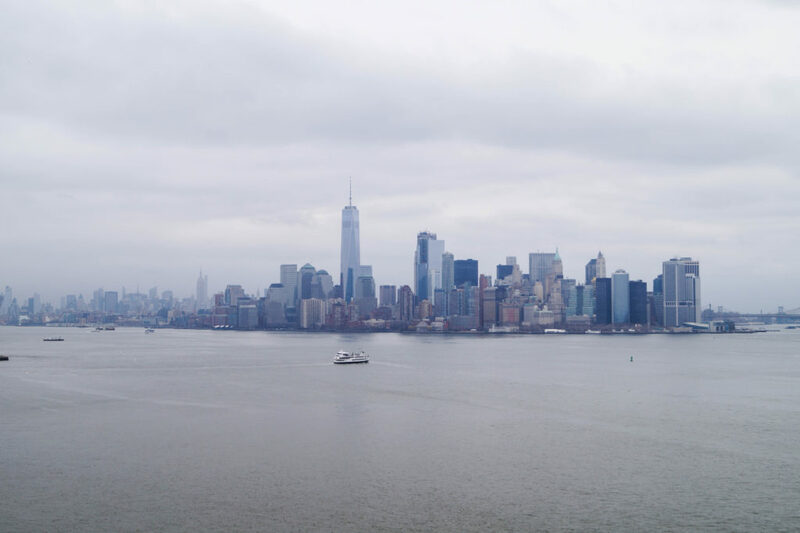 We had tickets to enter the Pedestal with wonderful close-up views of the Statue of Liberty, Ellis Island, the skyline of Manhattan, New Jersey, and the surrounding New York Harbor. From Liberty Island, we took the ferry to Ellis Island. 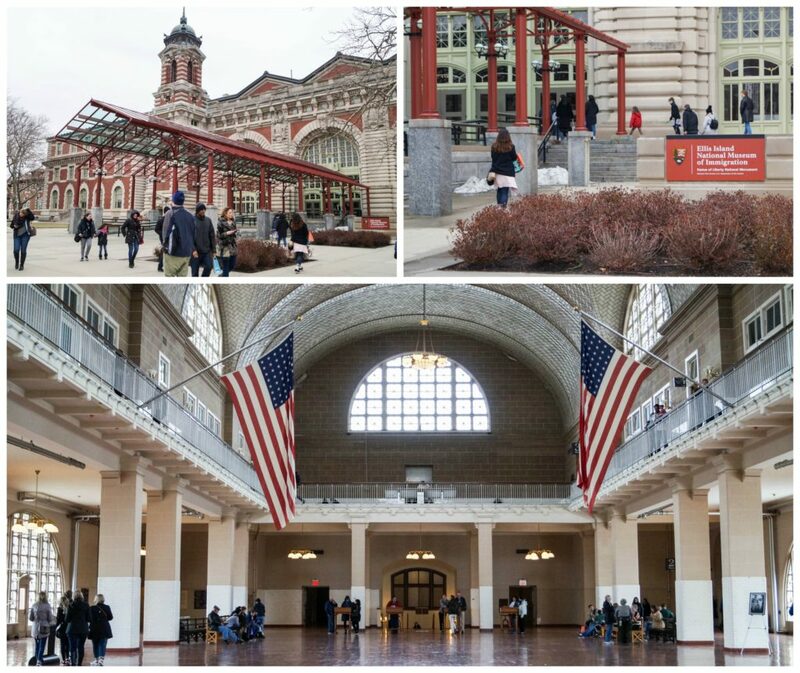 No additional ticket is required to enter the Ellis Island National Museum of Immigration. 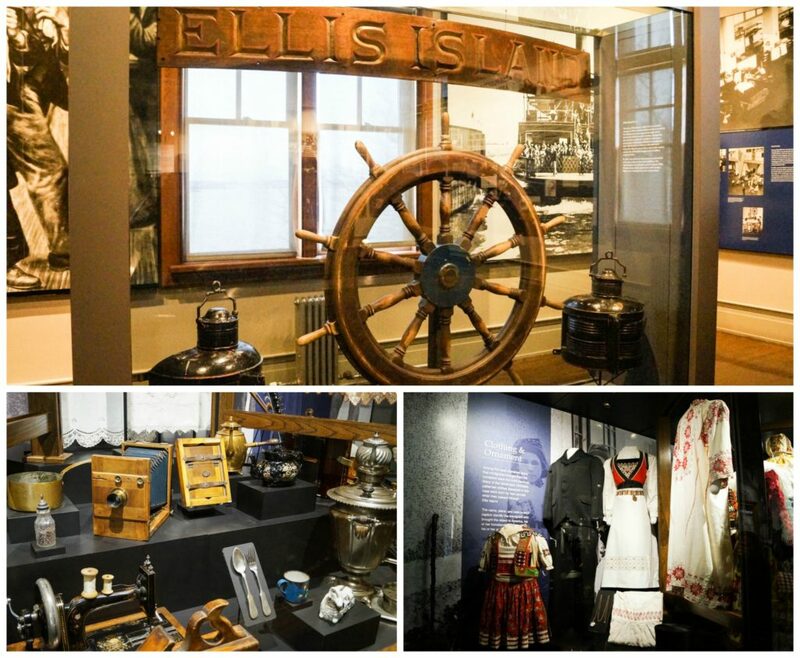 Ellis Island was the gateway for over 12 million immigrants between 1892 and 1954. The Registry Room (photographed above) would fill with up to 5,000 new arrivals a day. I loved the amount of detail included in the three stories of the museum. 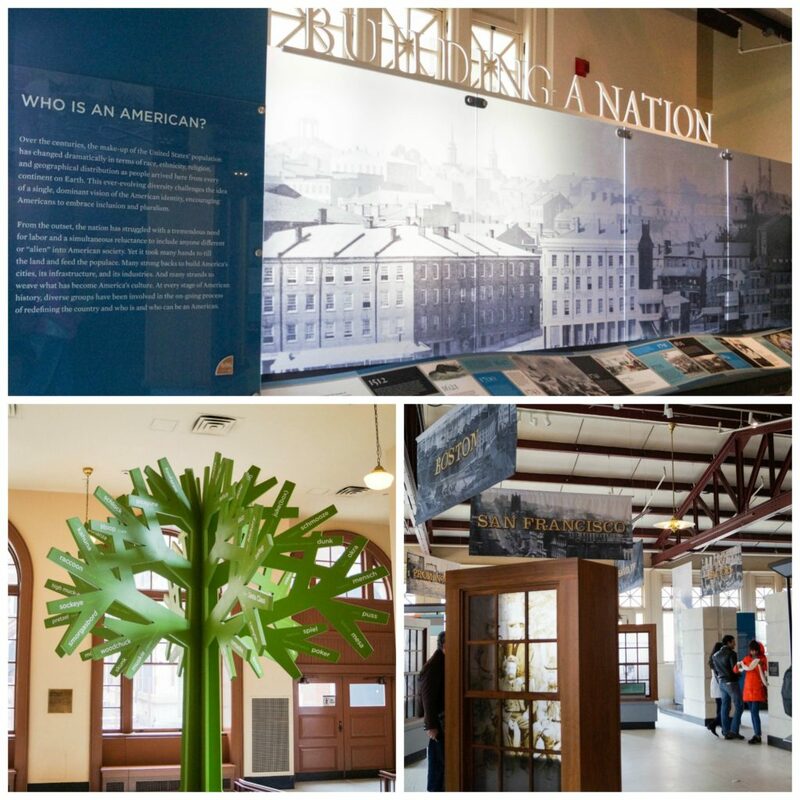 You will learn about the process immigrants went through on Ellis Island from inspections and medical screenings to legal hearings and the steps to citizenship. The first floor takes you through the history from 1550 to the present including first hand accounts and stories with interactive media and hands-on exhibits. The Treasures from Home exhibit was also fascinating with everyday and favorite items from the peak immigration period of the late 19th and early 20th centuries. 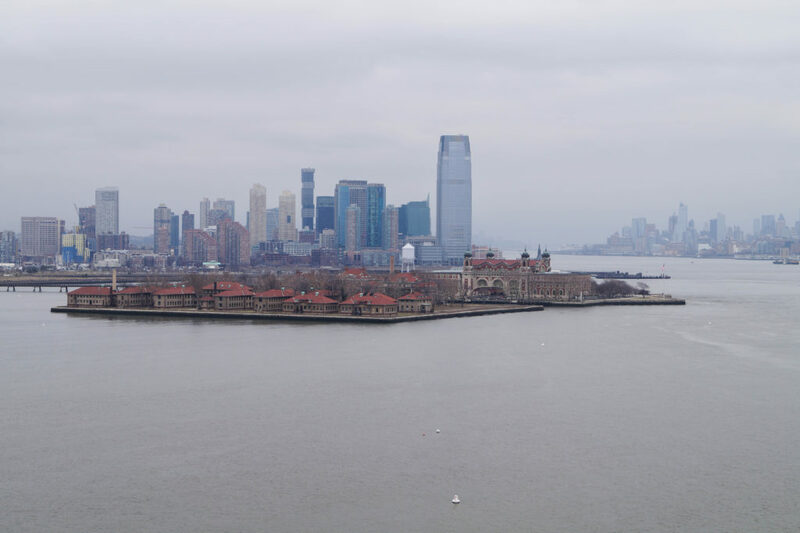 Have family that immigrated through Ellis Island? You can search for their records here. After arriving back in Battery Park, we took the subway to the Brooklyn Bridge station for a couple of quick photos. 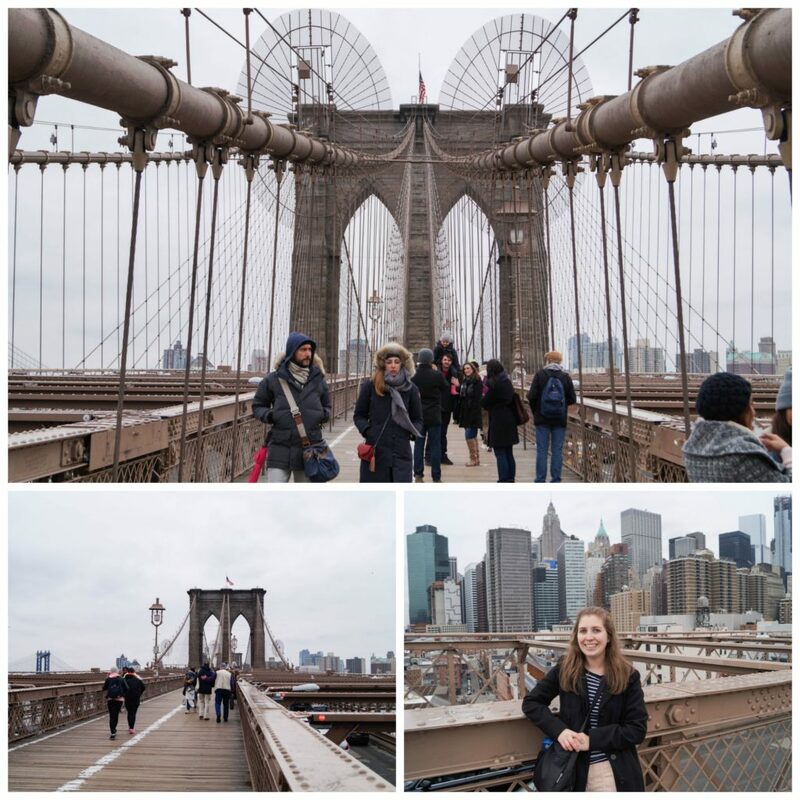 We didn’t have time to walk all the way across the bridge, but hope to explore Brooklyn on our next trip. 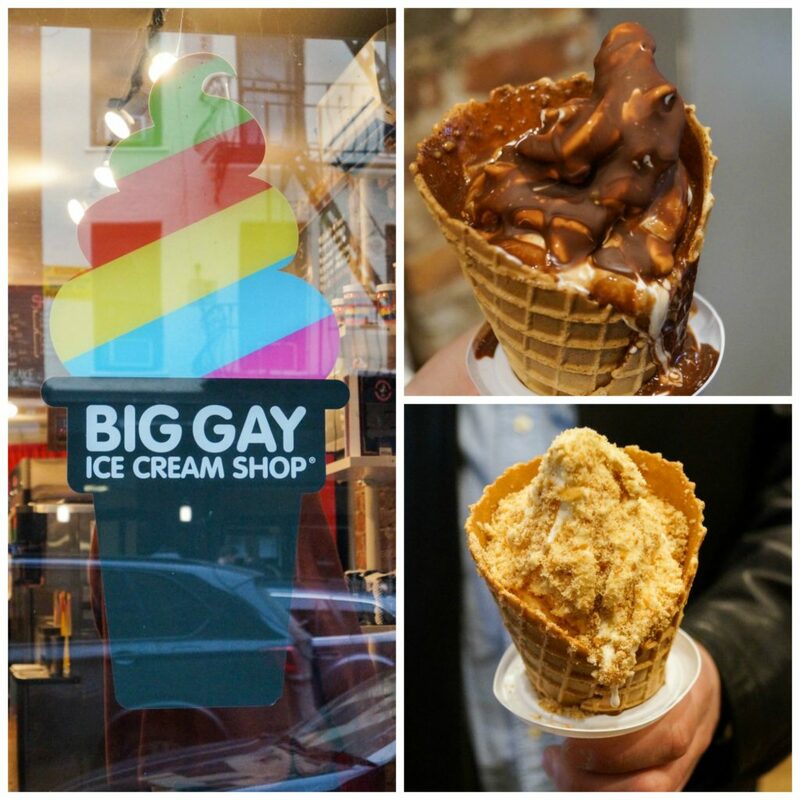 Before dinner, we made a stop by the Big Gay Ice Cream Shop on East 7th Street. We got lucky again with no lines, but it was also 40 degrees F outside. I got the Salty Pimp (vanilla soft serve with dulce de leche and coated with dark chocolate) and Chad had the Bea Arthur (vanilla soft serve with dulce de leche and covered in crushed Nilla wafers). They also have a cookbook if you wish to recreate their treats at home (I haven’t personally tried the cookbook yet). We ended the day with dinner at Oda House, a Georgian restaurant at 76 Avenue B. The food was incredible and definitely a highlight for me. I have made Khinkali at home, but otherwise hadn’t tried Georgian food before. 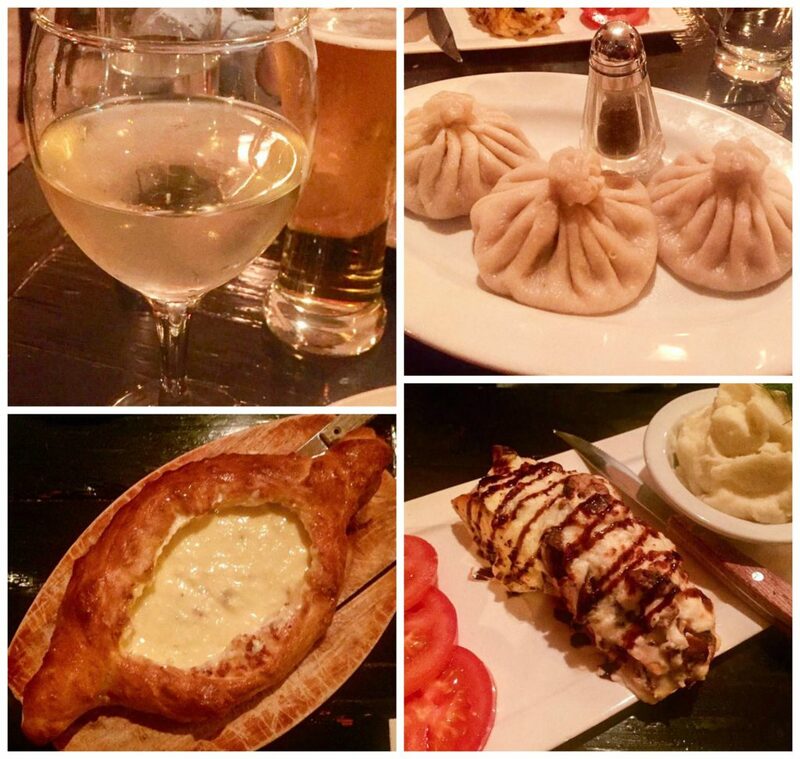 We started with a glass of Tvishi (semi-sweet wine from Marani), beer, and Khinkali (oversized hand-rolled juicy lamb and herb dumplings). They have a variety of Khachapuri to choose from and I picked the Adjaruli (bread with homemade imeruli and sulguni cheese and a poached egg in the center). Chad had the Oda House Special- salmon and mushrooms with mashed potatoes. After coming home, I found this recipe from Girl Versus Dough to make my own bagels since Evan started requesting them after seeing my photos from Ess-a-Bagel. This version only requires a couple of hours, but there are others that take a day or two of prep. I used bread flour, but high gluten flour would be best if it is available. I would have liked my bagels to bit a little thicker, but otherwise the flavor was delicious with a chewy texture. 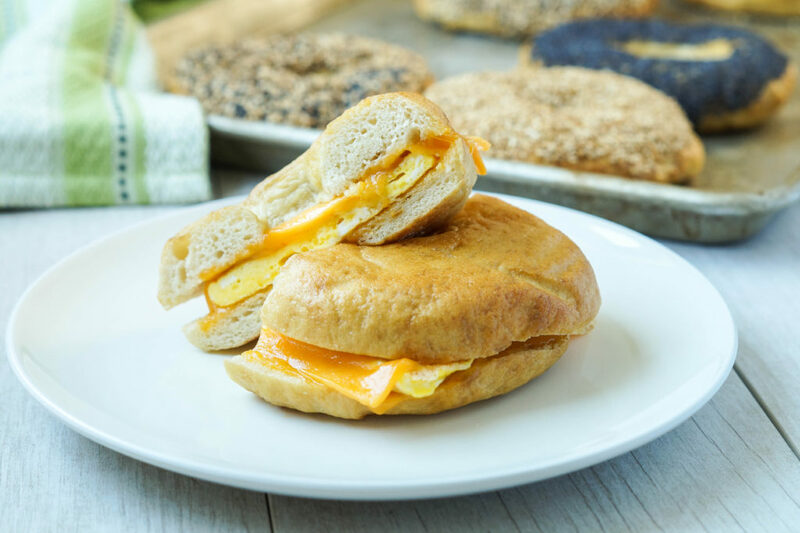 I loved the egg and cheese sandwich at Ess-a-Bagel, so made a similar one at home. Chad had his bagel with whipped cream cheese and lox. I also added malt syrup to the dough plus a few more tablespoons to the boiling water. Malt syrup is an extract syrup from sprouted barely. It adds a characteristic flavor to the bagels. It is available in some specialty baking stores or online: Barley Malt Syrup. Immediately after pulling the bagels out of the water, I put them on plates covered with the toppings. If you are having difficulty with the topping sticking, brush a little beaten egg over the top first before sprinkling on the seeds. I left a couple plain and topped the others with poppy seeds, sesame seeds, and a mixture similar to Everything Bagel Spice. In a small bowl, sprinkle the yeast over 1/2 cup of the lukewarm water. Stir and allow to sit until frothy, 5-10 minutes. In the bowl of a stand mixer fitted with a dough hook or a large bowl, combine the flour and salt. Mix in the frothy yeast and malt syrup. Slowly add the remaining water to form a dough. On a lightly floured surface, knead the dough until smooth and elastic. Transfer to a greased large bowl, turning to coat, and cover. Allow to rest in a warm place until doubled, 1-2 hours. 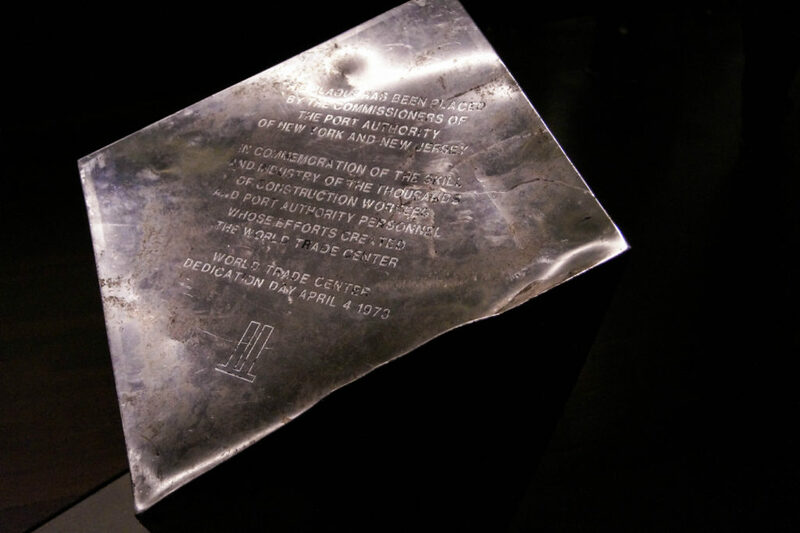 Line two baking sheets with parchment or grease. On a lightly floured surface, divide the dough into 8 equal pieces. Form one piece into a smooth ball, tucking the edges under and pinching to seal. Poke a hole in the center and evenly stretch until the hole is about 1 inch wide. Place on prepared baking sheet and repeat with remaining pieces. Cover lightly with towels and allow to rest for 10 minutes. Preheat oven to 425 degrees F. Bring a large pot of water to a boil. Once boiling, add the baking soda and malt syrup. Gently add the bagels to the water in batches (I boiled 2 at a time) and boil for 1-2 minutes, then flip and boil the other side for another 1-2 minutes. 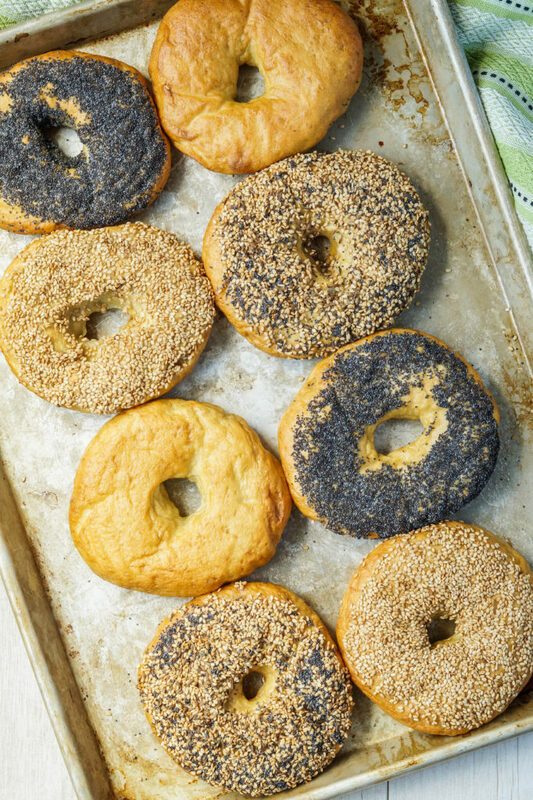 Use a large slotted spoon or spatula to transfer the bagels to the baking sheet and immediately add desired toppings. Repeat with remaining bagels, separating them about 2 inches on the baking sheets. Bake in preheated oven until golden, 15-20 minutes. Allow to cool to room temperature before slicing and serving with desired accompaniments. Great article and brings back so many memories of when I once lived in the met area. I love the idea of visiting classic NYC style shops for a bite or 2 before & after. I so miss the bagels to be had there! 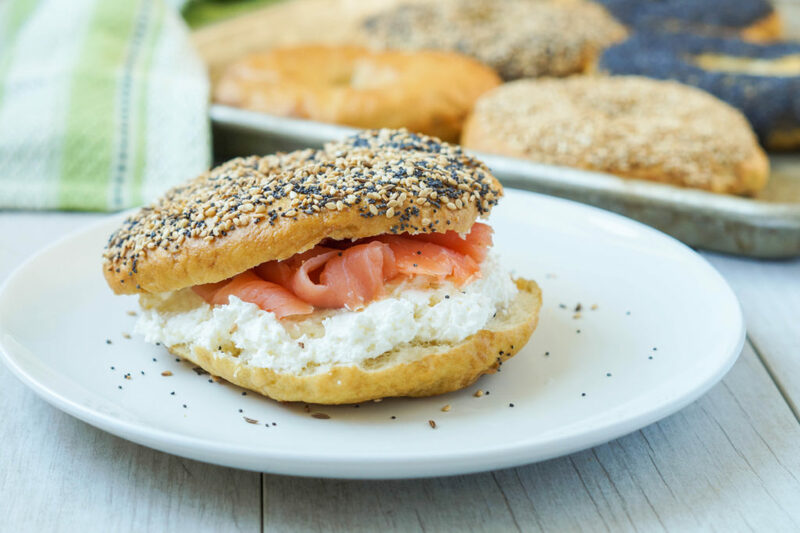 Those bagels look incredible, I love how you incorporated a recipe into your trip! I really hope to be able to visit this memorial one day. 🙁 This has also been an issue at the Holocaust Museum here in DC. They even had to post a notice to please not use their site to play Pokemon last summer. 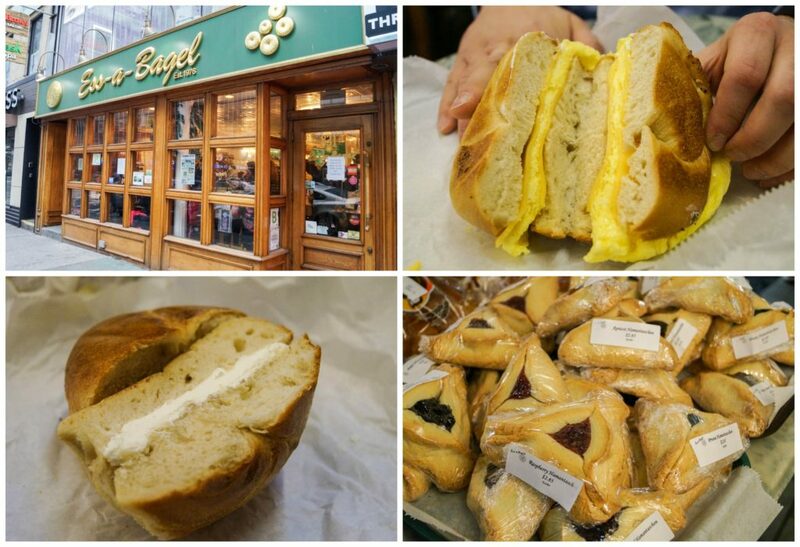 Oh, how I miss NY bagels! This sounds like an amazing trip, and the memorial is something I definitely have to see. I rarely visit NYC, but now I have a much better idea of what to do while I’m there this fall!